Jackson Tjota is a digital artist, with fantasy art as his primary focus. 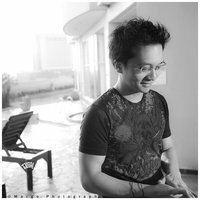 Originated from Jakarta, Indonesia, he graduated from RMIT University in Melbourne, Australia, as a 3D animator and visual FX artist. It was only then that he realised that amongst most forms of visual arts, drawings and paintings are his passions all along. As of 2016, Jackson is learning to be a tattoo artist, expanding his type of canvas. Jackson currently works as a freelancer for various international companies and independent authors, mostly on trading-cards and novel cover illustrations.